Q. 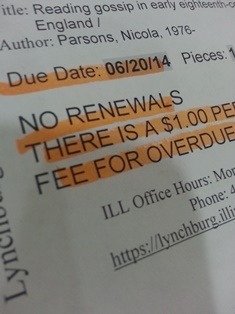 When is my interlibrary loan due back at the library? The slip on the front of your item will show the due date for that item. Removing the slip may cause you to incur a fee of $1 per day for overdue loans. Other libraries set their own due dates, per each item loaned, per each transaction. Even if you request multiple loans at the same time, depending on the other libraries' policies, the due dates could be different when you pick them up.